Tapered flow techniques can dramatically cut the cost of turning brackish water into something drinkable. Seder Boqer, Israel --- Desalination is increasingly seen as one of the main techniques for extricating the world from a water crisis. Australia, China, and some nations in southern Europe have laid plans to build utility-scale plants. Israel already gets 20 percent of its water from desalination and may move toward getting 100 percent of its fresh water from recycling and desalination in a few decades' time. But what about water-stressed nations like Chad or Burkina Faso that don't have coastlines or easy access to the sea? These countries often have brackish water supplies that could be converted to drinking water but currently can't be used. Disposing of the waste brine, moreover, remains a difficult problem: you can't spray it back in the sea where it will be diluted. There is no sea. Back in the '70s and '80s, Saudi Arabia effectively killed the soil in some regions by dumping desalination brines on empty land. Later this summer, Rotec, an Israeli firm, will pull the wraps off a prototype plant in Jordan that will highlight a technique that the company calls 'tapered flow.' This process can both boost the amount of water from a given desalination plant and lower the cost of desalination by around 20 percent. A current prototype in Israel processes 120 cubic meters a day and converts 88 percent of the salty water into fresh water. Ideally, the data from these two plants will allow Rotec to start looking at commercial plants. "Inland, brine disposal is a huge problem," said Jack Gilron, the CTO Rotec and a professor at the Zuckerberg Institute for Water Research at Ben-Gurion University. (I'm a guest here at the moment.) "You are using prime real estate for evaporation ponds. [...] As stressed as Israel is, Jordan is even more stressed. In Amman, not everyone has water." It works effectively by carefully orchestrating plumbing in a desalination plant. Desalination works by pressurizing water and running it through a membrane. Half of the water gets desalinated and the other half becomes a brine with twice as much salt as it had before. The brine is then often run through another round of cleaning to squeeze out some more water. To maintain the pressure, however, plant managers can only put half as many tanks in the second line. (If you had the same number of tanks, the water pressure would drop by half and the process would break down.) In a hypothetical plant, the first line might consist of four tanks and the second line might contain two purification tanks. That's still a lot of brine, and a brine storage facility can cost $2 to $2.50 per cubic meter of mass stored: The costs come because brine must be stored in specially designed tanks. The unidirectional flow of water also creates scaling on the membranes, curbing performance. Rotec gets around this problem by dynamically changing the direction of the water flow with inputs from software and sensors. Water can be pushed back through the membranes in the opposite direction so a tank that was on the secondary line can suddenly find itself on the first line of desalination. Tapered flow increases the water out of the plant to 88 percent. Higher water yields mean a more condensed waste brine and lower disposal costs. Desalination now costs around 45 cents a cubic meter for water. The technique could bring the costs down to 36 cents. Just as important, changing the flow of water in the tanks prevents scaling and mineral build-up, lowering maintenance requirements and allowing the membranes to last longer. The solids just don't have a chance to settle and accumulate on a surface. "We want to cut the waste brine by 50 percent," he said. "If you can cut the brine in half, you cut your brine disposal costs [roughly] in half." Another concept that holds promise for inland desalination: vertical evaporation. Instead of sitting in a pond, brine is pumped through sheets of fabric. The wind wicks away the water but leaves the salt and a brine that is 15 to 20 times more dense than that which is found in a typical waste water tank. "We can get 40 square meters of evaporation surface on one square meter," Gilron said. "You want to take it down to a solid if you can." 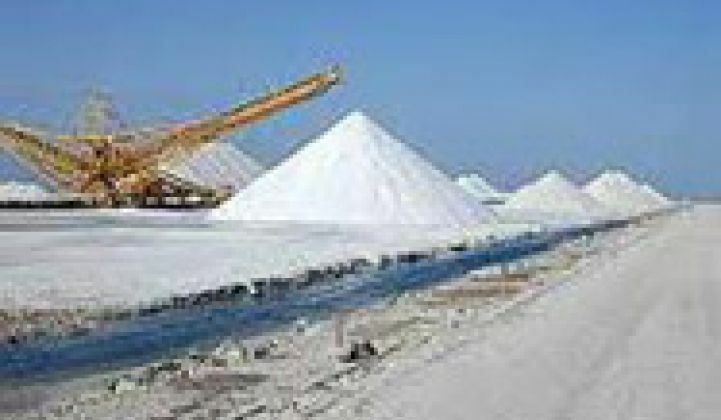 Potentially, the salt, now much more condensed in the saturated brine, could be sold as a raw material to the building materials or chemical industries. Research is also underway to try to tie concentrated PV or solar thermal technology to desalination plants. Because desalination requires power, some skeptics fear that it will prompt dry nations to consider building nuclear plants. A little further out is a technique that involves combining brackish water, reverse osmosis and electronic distillation. Potentially, this could let water companies convert 97 percent of the incoming water into fresh water. Rotec won't approach this market on its own, but will instead team up with large and established electronic distillation experts like Siemens.